is a powerful, free radical fighting, antioxidant-packed drink mix that delivers the vital nutrient benefits of 20 superfoods. 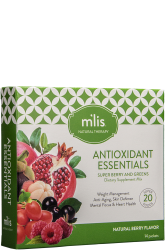 Most people don't eat enough antioxidant-rich foods, but Antioxidant Essentials makes it easy for you to get these life-enhancing nutrients in great tasting, natural berry flavor on-the-go packets. Once Daily, add one (1) packet to 6-8 fl. oz. of cold water. Mix well and enjoy.